Remembering Flintstones Shaker Maker for the Flintstones 50th Birthday! Did you happen to see the Flintstones picture on Google today? It took me a while to see that it spells google. The reason is because the Flintstones turned 50 today. The first episode aired on September 30, 1960. Happy Birthday Fred, Wilma, Barney, Betty, Dino, Pebbles and Bam Bam! 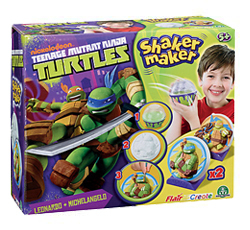 The Shaker Maker sets were basically arts and craft sets. These kind of sets were much more popular in the 60's and 70's then they are now. Toy stores had whole sections of models, paint by numbers, wood burning sets, Shrinky Dinks, Cast 'n Paints, and Shaker Makers. After shaking the mix down into the mold, you popped off the covers and the two mold pieces, placed your new character on the "Drying Stand" and waited for what seemed like forever. After the mix had dried, you could then, as the box says, paint like wild! That description makes me laugh. If you can't see the picture, it reads: Combine Shaker Maker Magic Mix with water, shake - and in minutes you have a character that wiggles and jiggles. Like Magic it Shrinks and Hardens - When Dry, Paint Like Wild! I remember being disappointed that they shrank and that you would run out of magic mix. When I got a little older, I discovered that you could buy regular plaster of paris so I used the molds again with the plaster. Who knows, maybe I'll find time to make some new ones and paint them. If so i'll append this post and show pictures of them. This Flintstones set made three characters; Fred Flintstone, Barney Rubble, and Wilma holding Pebbles. Once again, I like the copy on the box: "It's Fun... It's Silly... It's Fantastic... 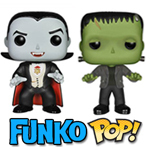 Collect 'em... Trade 'em, they're wild! When I opened up this Flintstones set box, I also found the molds and the instruction set for the Disney Shaker Makers, or I guess I should call them The Shaker Maker Walt Disney Character Set. The three characters with the Disney Shaker Maker set are Micky Mouse, Donald Duck and Pluto. I should make some plaster ones of these too! Actually, my daughter is good at painting. I wonder if she would want to paint them. I know when I was a kid, I sure loved making these. 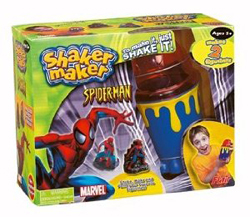 Does anyone else remember having Shaker Makers? Maybe I shoud go make some of the Flintstones molds right now to celebrate their 50th birthday. Yabba Dabba Do! Happy Birthday Flintstones! Since writing this article, I have been contacted a few times to let me know that there are Shaker Makers on the market again. Get ready to shake... and make!